Many cancer symptoms are non-specific, common and often caused by non-malignant conditions. The National Primary Care Cancer audit 5 and the Cancer Awareness Measure 6 tell us that patients may delay visiting their GP with early symptoms of cancer for various reasons, including a lack of awareness of the potential significance of the symptoms. GPs need to ensure their practice policies and consultations are sensitive to these barriers. Diagnosing cancer early is not easy. As GPs, we worry about missing cancer. We see patients whose symptoms may be attributable to cancer on a daily basis but relatively rarely see a new cancer. We are urged to diagnose cancer earlier, requiring more investigation and referrals, while being responsible for using NHS resources wisely. A Danish study found an association between poorer one year survival rates for cancer patients and a primary care structure where GPs have a gatekeeper role. 11 If these findings were replicated in the UK, there would be a major challenge to GPs to review work patterns and reconsider how we manage risk. The International Cancer Benchmarking Partnership is at present examining primary care attitudes, behaviours and systems for cancer referral. There are referral guidelines for suspected cancer in the different nations within the UK, and cancer services may have local plans for implementing these guidelines. 12, 13 A desktop format based on NICE guidance is available from Macmillan. However, referral guidelines are not perfect. Many patients fitting the referral criteria do not have cancer and many of those with cancer do not have symptoms that “fit” the guidelines. Tools which calculate the risk of a patient having an undiagnosed cancer can support the GP in making decisions about referral and investigation. Two tools have been developed to assist UK GPs in decision making. 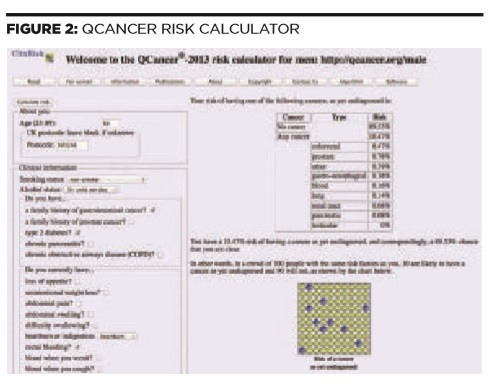 This primary care risk assessment resource was developed by Professor Willie Hamilton from the CAPER (Cancer Prediction in Exeter) programme – a series of case control studies which identified symptoms of common cancers seen in general practice and quantified the risk of cancer associated. 20 The tools produce a “positive predictive value (PPV)”, i.e. the chance of a patient having the disease of interest, based on a reported symptom, group of symptoms, signs or test result. Originally developed in a paper format, there is now a computer tool (Figures 3a-3b). Both of these resources are currently being evaluated as GP desk-top tools for bowel, lung, upper GI, ovarian and pancreatic cancers. When used in pilots, a threshold of >2% has suggested considering urgent referral, and one of 5% has advised urgent referral. There is however no clear consensus on these thresholds. Patients diagnosed through screening have better overall outcomes than those diagnosed through other routes. 14 It is of concern that the uptake of cervical screening (particularly among younger women) has been falling nationally and the uptake of bowel cancer screening remains significantly below the target of 70% in many parts of the UK, with an association between greater levels of deprivation and poorer uptake of screening. Figure 4 shows key examples from the evidence base of benefit derived from screening for cancer. Suggested actions for GP practices The RCGP toolkit Improving Cancer Diagnosis illustrated how significant event analysis (SEA) encouraged GPs to think about practice issues. The resource can be found at Improving Cancer Diagnosis. The importance of continuity of care and good safety netting. Patients with metastatic disease at diagnosis or diagnosed after emergency admission. Were there missed opportunities for an earlier diagnosis? Patients not attending for screening – what actions can the practice take to promote or increase uptake? The Macmillan Revalidation Toolkit provides a framework that GPs and practices can use to look at their cancer care, with many suggestions for audits and reviews. 33 GPs in England have access to their practice cancer profile data through the Cancer commissioning Toolkit and can use the data to benchmark themselves against both local and national colleagues. 2 Treatments are also likely to be less taxing for the patient, with subsequent return to previous life and activity. 3 Earlier diagnosis remains a challenge to primary care, because GPs see many patients with symptoms that are potentially cancerous, although most are not. 4 Earlier diagnosis is a challenge to administrators, because reaching earlier diagnoses would require referral and investigation of more patients. 5 Earlier diagnosis is seen as cost effective. 34 The international benchmarking project is currently providing insights into differences between the UK and countries with better cancer outcomes. 1. Coleman M, Forman D, Bryant H, et al. Lancet, vol 377, no 9760, pp 127–38. 2. How to improve cancer survival Explaining England’s relatively poor rates. Foot C & Harrison T. Kings fund / Cancer Research UK. 7. Forbes L, Simon A, Warburton F, et al. The International Cancer Benchmarking Partnership Module 2 Working Group. Br J Cancer. 2013;108(2):292-300. 8. Detect cancer early http://www.scotland.gov.uk/Topics/Health/ Services/Cancer/Detect-Cancer-Early. 9. Department of Health, Public Health England letter 20 Dec 2013 Gateway ref PHE 2013-357. 10. Be clear on cancer http://www.cancerresearchuk.org/cancer- info/spotcancerearly/naedi/beclearoncancer/. 11. Vedsted P, Olesen F. Br J Gen Pract. 2011 Aug;61(589):e508-12. doi: 10.3399/bjgp11X588484. 12. Scottish referral guidelines for suspected cancer October 2013 http://www.healthcareimprovementscotland.org/our_work/ cancer_care_improvement/programme_resources/scottish_ referral_guidelines.aspx. 13. NICE Referral for suspected cancer (CG27) 2005. 14. Routes to Diagnosis 2006-2010 National Cancer Intelligence Network. 21. Hamilton W, et al. Supporting earlier diagnosis of cancer in primary care: assessing the usability and impact of a primary care cancer Risk Assessment Tool. Report to the National Cancer Action Team, April 20 2012. In 2013 Macmillan Cancer Support successfully piloted the use of an electronic Cancer Decision Support Tool in over 550 GP practices across England, Scotland and Wales. Following successful completion of the pilot, and building on the early evaluation ﬁndings, Macmillan is now working to improve the functionality of the tool, with a view to making it available to all GP practices across the UK. 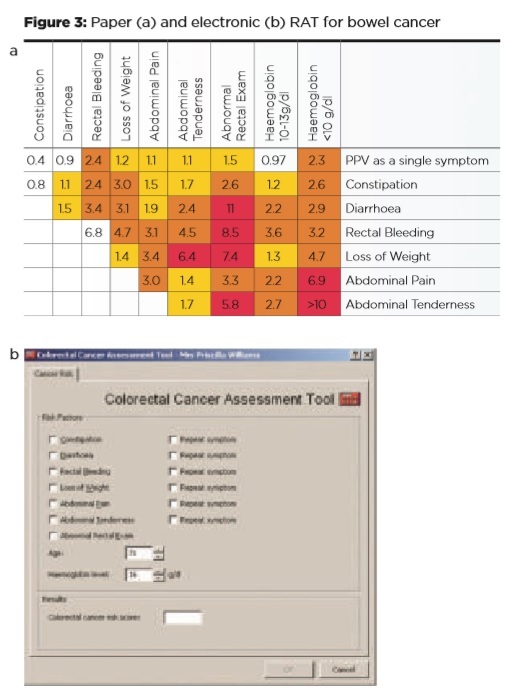 The tool comprises a reactive prompt, alerting GPs to potential cancer risks, an easy to use symptom checker that can be called up during consultation, and a risk stratiﬁcation function that enables practices to list their practice population in order of risk. Macmillan is continuing to work alongside BMJ Informatica, who have led on the software development, with the objective of creating an easy to use, downloadable version of the tool. Taking this approach will simplify the installation process as well as improve usability. Macmillan is also in the process of developing different versions of the tool that will sit on a number of IT platforms. Cancer Research UK is undertaking the formal evaluation of work, with the ﬁnal evaluation report due in the summer of 2014. Early evaluation data has already shown that use of the tool has inﬂuenced GPs in their clinical decision making when referring for cancer. The prompt feature acts as a reminder to GPs to consider the possibility of cancer where a risk has been calculated. Formal training and support will be available, with a selection of interactive training resources available on www.macmillan.org.uk/earlydiagnosis. For more information on the Cancer Decision Support Tool or any other projects within Macmillan’s Early Diagnosis Programme of work, contact Phil Hall, Macmillan Early Diagnosis Programme Coordinator at phall@macmillan.org.uk , or visit the Early Diagnosis page.